Typo ruin your social media masterpiece? Facebook is starting to let you edit a post’s text after you publish it. The feature comes to the web and Android in an update today, and to iOS soon. Previously you had to delete your post, lose all your Likes and comments, and repost to edit something. Android users also get emotion and activity sharing, events at a glance, and photo album creation today. Soon you’ll be able to edit all posts and comments from the web, Android, or iOS. 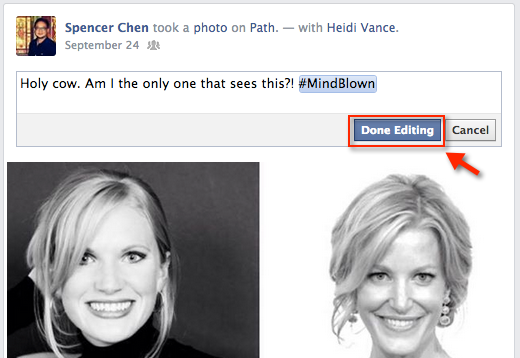 To edit posts, you’ll be able to click the down arrow in the top right of one of your posts and select ‘Edit Post’ to change the text, then click “Done Editing” as shown in this screenshot from Spencer Chen. Your revisions and original post will still be viewable if friends check your post’s edit history, though. For comments, hovering over or tapping a post will reveal a pencil icon on the right you can click to start editing. The long-requested Facebook feature was likely held back because the company was scared users would bait and switch each other. Imagine if a friend posted “Like this post if you hate Justin Bieber,” and you liked it, but then they edited it to say “Like if you LOVE Justin Bieber.” That could defame your music tastes. But Facebook apparently found that the edit history section was enough to deter people from such trickery. It started allowing users to edit comments in June 2012, and Page owners have also had the ability to edit text on photo posts for a while. Facebook seems to have encountered few problems so now everyone is getting the option. Google+ has had post editing for a while, facilitating its more long-winded, in-depth discussion style. Don’t expect editing to come to Twitter anytime soon, though, as it wouldn’t jive with the service’s real-time permanent record style. The feature could be a big help on mobile where touchscreen keypads make it easy to screw up. It’s always a shame to have to wash away the comments you got immediately just to make an “its” an “it’s”. Facebook may have been losing posts to deletions because of typos, so the change could also add just a tiny more content flowing to the News Feed that brings in eyeballs for its ads.